Occasionally, bottles come up for auction at McTears or on eBay. In July 2005 we approached George Grant, the sixth generation of the Grant family of Glenfarclas, with the idea of bottling a single cask as the first official distillery bottling for the Highlander Inn. 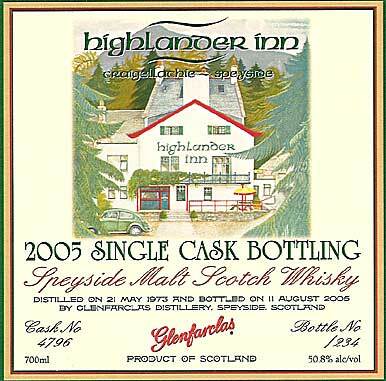 As a new venture in the whisky tourism industry, it was the ideal distillery to match with the Highlander Inn as "the Spirit of Independence". We visited the distillery and sampled over 2 dozen casks of varying ages in different traditional 'dunnage' warehouses. Then we came to Cask no. 4796, distilled on 21st May 1973. That was it ~ the one for us. 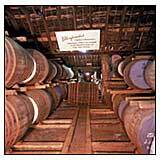 Having lain undisturbed for over 32 years, the angels agreed to surrender only 234 bottles (70cl) when bottled by the distillery at its natural cask strength of 50.8%. Maggie Riegler of the Greenhall Gallery in Craigellachie was once more commissioned to produce the label in her own inimitable style ~ note Tatsuya's 1970's VW Beetle at the bottom of the picture! The original painting hangs proudly in the bar. Each bottle is accompanied by its unique numbered certificate of authenticity, signed by Duncan Elphick of the Highlander Inn and John Grant, Chairman of Glenfarclas Distillery. 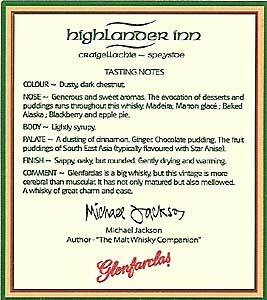 Michael Jackson once again agreed to write the official tasting notes which are shown on the back label. It was available for purchase from the Highlander Inn but quickly sold out.